You are buying the Tranquility ATN All-Through-the-Night Youth Brief 18"-26" 2183CA 100/Case, manufactured by Tranquility Incontinence Products. 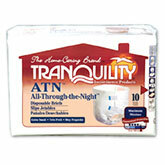 Tranquility is a leading manufacturer of incontinence products like briefs, underwear, liners, pads, and more. At ADW Diabetes, we offer a large selection of Tranquility products with superior service, excellent pricing, and expedited shipping options.